Sir William Hoy is probably the most loved icon to have ever set foot in the sleepy seaside town of Hermanus in the Western Cape. His story goes far beyond this little town, with his greatest achievements giving him countless honours during World War I, but this story is how his love for this town made it the ideal place for a science station of global importance. 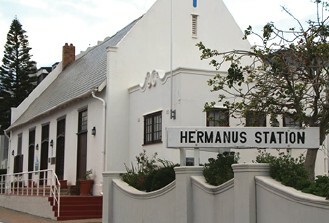 It all revolves around a train station in Hermanus, a town that has no trains and no railways at all! Born in Scotland in 1868, Sir William Hoy left school at the age of 12, and became a clerk at the North British Railway in Edinburgh. In 1890, he was inspired by a recruiting officer of the Cape Government Railways to apply for work in Cape Town, a place he was already greatly fond of. Some years later he became the Transvaal agent for the Railways, in charge of the Military Railways during the Anglo-Boer War. Sir Hoy became the youngest General Manager of the South African Railways ever, gaining control of the second largest government-owned railway system in the world. It is at this point that Sir Hoy decided to leave Cape Town in search of the perfect holiday destination, and found Hermanus where he could enjoy his favourite hobby – fishing. So in love was he with this remote paradise that he halted plans to build a railway through Hermanus quite literally in their tracks. The plans were so advanced that a railway station building had already been built but Sir Hoy had witnessed what the railway lines did to small villages like Kalk Bay, and was determined to keep Hermanus a village with fresh air and visitors who loved the town enough would go the extra mile to reach it. He went as far as establishing a coach service between Cape Town and Hermanus, to make sure that not even a single train ever entered the station building at Hermanus. 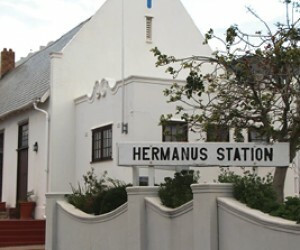 As a result, Hermanus has a train station but no trains! While some grumbled at the decision, many were overjoyed at the blessing Sir Hoy granted Hermanus with his decision. For his services to the town and to transport in general, Sir Hoy was knighted in 1916. Having worked hard to keep the town pristine, Sir Hoy did not live long to enjoy his favourite place in the world. He died of cancer in 1930, shortly after retiring at the age of 62. Meanwhile at the University of Cape Town, scientists were sharpening their scientific instruments to carefully measure the magnetic field of the Earth, which was very important for navigation and contemporary scientific research. The Magnetic Observatory was based at the University of Cape Town but when electric trains were introduced in 1932, they created an electromagnetic field that interfered with magnetic readings taken by sensitive instruments. Since no railway lines went through Hermanus, scientists identified it as an ideal place to relocate the Observatory. The Hermanus Magnetic Observatory was officially opened for operation on January 1, 1941 by Professor Ogg of UCT. After retiring in 1946, he handed the reins to Mr van Wijk, who directed the Observatory until his retirement in 1977. The Hermanus Magnetic Observatory later became the Space Science Directorate of the South African National Space Agency (SANSA). Today, SANSA contributes to the field of space science and technology in many ways and is South Africa’s government body for the promotion and peaceful use of space while fostering co-operation in space-related activities. Earth’s magnetic field has fascinated scientists for decades. Life on Earth wouldn’t have evolved without this cocoon which protects us from the harsh environment of space. With over 80 years of data from monitoring the Earth’s magnetic field the Space Agency is in a unique position to provide vital data for research projects and specialised services to the aerospace, maritime and aviation sectors. The Earth’s magnetic field is a key factor for accurate navigation, and is unfortunately not a static, unchanging phenomenon. SANSA provides an annual update of magnetic inclination and declination to enable charts and maps to be updated helping marine vessels and aircraft find their way through the Earth’s magnetic field. Among other things, the Agency also operates the only Space Weather Warning Centre in Africa under the International Space Environment Service (ISES). The highly trained staff, keep a close eye on how space weather affects our modern day technology on Earth and in space. Our life giving star, the Sun, is constantly active and every now and then it erupts, spewing out charged particles that travel through space at speeds over 100 km per second. These solar storms can damage technology on Earth and in space which we rely on daily for internet and mobile phone connectivity, DStv, electricity supply, and GPS services. In the USA and UK, space weather is listed on the National Risk Register – it is regarded as a high impact low probability disaster. But in South Africa, it is not yet included in the Disaster Management Act. SANSA recently completed two policy briefs on the “economic impact of space weather” and “space weather risks to the aviation sector”, which will help to inform policymakers and the Civil Aviation Authority about the urgency of planning for severe space weather storms. While Sir Hoy worked hard to keep Hermanus train-free, he inadvertently made it a “magnetically clean” zone ideal for monitoring the Earth’s magnetic field and space weather - the town of Hermanus and the rest of the world thanks him for it. Today, the graves of himself and his wife, Gertrude Hoy, rest atop Hoy’s Koppie which overlooks the beautiful town Hoy so lovingly helped to create. If you are in the Hermanus areas do join the Space Agency on a Wednesday at 11:00 for a fascinating free tour of this unique facility.